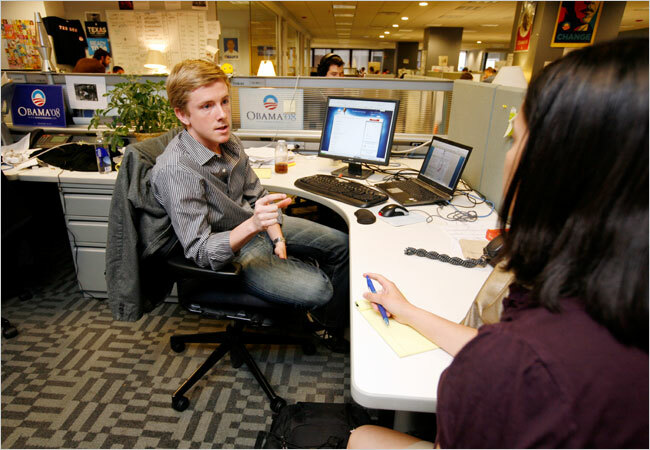 CHRIS Hughes, 24, a founder of Facebook, left the company to develop Senator Barack Obama’s Web presence. Chris Hughes takes that as a compliment. Mr. Hughes, 24, was one of four founders of Facebook. In early 2007, he left the company to work in Chicago on Senator Obama’s new-media campaign. Leaving behind his company at such a critical time would appear to require some cognitive dissonance: political campaigns, after all, are built on handshakes and persuasion, not computer servers, and Mr. Hughes has watched, sometimes ruefully, as Facebook has marketed new products that he helped develop. But in fact, working on the Obama campaign may have moved Mr. Hughes closer to the center of the social networking phenomenon, not farther away. The campaign’s new-media strategy, inspired by popular social networks like MySpace and Facebook, has revolutionized the use of the Web as a political tool, helping the candidate raise more than two million donations of less than $200 each and swiftly mobilize hundreds of thousands of supporters before various primaries. The centerpiece of it all is My.BarackObama.com, where supporters can join local groups, create events, sign up for updates and set up personal fund-raising pages. “If we did not have online organizing tools, it would be much harder to be where we are now,” Mr. Hughes said. Mr. Obama, now the presumptive Democratic nominee, credits the Internet’s social networking tools with a “big part” of his primary season success. Now Mr. Hughes and other campaign aides are applying the same social networking tools to try to win the general election. This time, however, they must reach beyond their base of young, Internet-savvy supporters. By early April, Mr. Obama’s new-media team was already planning for the election by expanding its online phone-calling technology. In mid-May, to keep volunteers busy as the primaries played out, the campaign started a nationwide voter registration drive. And in late June, after Senator Clinton bowed out of the race, the millions of people on the Obama campaign’s e-mail lists were asked to rally her supporters as well as undecided voters by hosting “Unite for Change” house parties across the country. Nearly 4,000 parties were held. The campaign’s successful new-media strategy is already being studied as a playbook for other candidates, including the presumptive Republican nominee, Senator John McCain. The heart of the campaign’s online strategy is a teeming corner of Mr. Obama’s headquarters two blocks from the Chicago River, a crowded space that looks more like an Internet start-up company than a campaign war room. During a visit in late May, a bottle of whiskey sat, almost empty, atop a refrigerator (there had been plenty of victories to celebrate lately, a staff member explained). Sitting amid a cluster of cubicles, Mr. Hughes, whose title is “online organizing guru,” handles the My.BarackObama.com site, which is known within the campaign as MyBo. Other staff members maintain Mr. Obama’s presence on Facebook (where he has one million supporters), purchase online advertising, respond to text messages from curious voters, produce videos and e-mail millions of supporters. Before helping build Facebook, the social network of choice for 70 million Americans, the fresh-faced and sandy-haired Mr. Hughes, who grew up in Hickory, N.C., went to boarding school at Andover, where he joined the Democratic Club and the student government. In the fall of 2002, he went to Harvard, where he majored in history and literature. He and a roommate, Mark Zuckerberg – now the chief executive of Facebook – shared a room that was “just about as small as my cubby at work is these days,” Mr. Hughes said. Mr. Zuckerberg and another Facebook co-founder dropped out in 2004 to work on the site full time, but Mr. Hughes graduated in 2006 before venturing to Silicon Valley. In February 2007, after showing interest in Mr. Obama’s candidacy and being reassured that the campaign’s new-media operation would be more than “just a couple Internet guys in a corner,” he left Facebook, where he has stock options that are potentially worth tens of millions of dollars, and moved to Chicago, where he lives – and dresses – like any other recent college graduate. “Cabs are a luxury,” he said. As supporters started to join MyBo in early 2007, Mr. Hughes brought a growth strategy, borrowed from Facebook’s founding principles: keep it real, and keep it local. Mr. Hughes wanted Mr. Obama’s social network to mirror the off-line world the same way that Facebook seeks to, because supporters would foster more meaningful connections by attending neighborhood meetings and calling on people who were part of their daily lives. The Internet served as the connective tissue. While many candidates reach their supporters through the Web, the social networking features of MyBo allow supporters to reach one another. Mr. Hughes’s abrupt shift from Facebook pioneer to campaign aide was not easy. In the lonely months before the Iowa caucus, he grappled with the small scale of his new social network, measuring its membership by the thousands rather than the millions he was accustomed to. He had to learn mystifying political shorthand (VAN, for voter file management; N.P.G., for the donor and volunteer database) and figure out how campaigns operate. Eventually, he grew comfortable. At first, his main focus was a single state. Throughout last summer and fall, the prevailing attitude was, “What can you do for Iowa today?” Mr. Hughes recalled. Mr. Obama’s win in the Iowa caucuses drove new supporters to the MyBo site in droves. Using the campaign’s online toolkit, energized volunteers laid the groundwork for field workers. So far, MyBo has attracted 900,000 members, although aides play down the raw numbers. In some primary and caucus states, volunteers used the Internet to start organizing themselves months before the campaign staff arrived. In Texas on March 4, Mrs. Clinton won the popular vote, but Mr. Obama came away with a lead of five delegates, thanks to a caucus win. Caucuses are a test of organizational strength, and Mr. Obama’s team used database technology to track 100,000 Texas volunteers and put them to work. This permitted campaign staff members to “skip Steps 1, 2 and 3,” Mr. Hughes said. So maybe the Obama core does “look like Facebook.” Mr. Penn’s remark, made at the Jefferson-Jackson Dinner in Iowa and reported by The Politico, was cited by both Mr. Rospars and Mr. Hughes in separate interviews. Virtual phone banks greatly benefited Mr. Obama. During the primaries, volunteers could sign in online, receive a list of phone numbers and make calls from home. The volunteers made hundreds of thousands of calls last winter and spring. At the end of June, the Obama campaign began carefully opening up its files of voters to online supporters, making it easier to find out which Democratic-leaning neighbors to call and which registered-independent doors to knock on. BARACK Obama with some campaign essentials: the Secret Service, his staff and his BlackBerry. One goal is to drive online energy into in-person support. From January to April, for instance, the Obama campaign spent $3 million on online advertising to steer would-be voters to their polling places with online tools that tell people where to vote. The locators “are hard to build, but once you build them, they have a very high return on investment,” Mr. Hughes said. Last month, acknowledging that attacks during the general election are likely to be more vociferous, the Obama campaign tried to capitalize on its network by creating a Web page, FightTheSmears.com. Through that site, the campaign hopes that supporters will act as a truth squad working to untangle accusations, as bloggers have informally in other campaigns and as many did when CBS reported on President Bush’s National Guard service in 2004. People who have posted on the site have already taken up five rumors, including that Mr. Obama was not born in the United States (a birth certificate was displayed) and that he does not put his hand over his heart during the Pledge of Allegiance (the site links to a YouTube video of him doing so). Republican strategists say, wryly, that Senator McCain’s 2000 campaign was innovative in its use of technology. (The candidate held a groundbreaking virtual fund-raiser and enabled supporters to sign up online.) But that was back when Mr. McCain ran as an outsider; as the presumptive nominee, he is no longer an upstart. His social network, called McCainSpace and part of JohnMcCain.com, is “virtually impossible to use and appears largely abandoned,” said Adam Ostrow, the editor of Mashable, a blog about social networking. By all accounts, Mr. McCain is not the BlackBerry-wielding politician that Mr. Obama is. But he has given credit to what he calls Mr. Obama’s “excellent use of the Internet,” saying at a news conference last month that “we are working very hard at that as well.” The McCain campaign recently reintroduced its Web site and hired new bloggers to broaden its online presence. Patrick Ruffini, a Republican strategist who was the Webmaster for President Bush’s 2004 campaign, said that a campaign’s culture largely determines its digital strategy. The McCain campaign “could hire the best people, build the best technology, and adopt the best tactics” on the Internet. “But it would have to be in sync with the candidate and the campaign,” Mr. Ruffini said. Mr. Hughes and other Obama aides say that their candidate gravitates naturally toward social networking, so much so that he even filled out his own Facebook profile two years ago. Mr. Obama has pledged that if he is elected, he will hire a chief technology officer; Mr. Hughes’s face lights up at the thought. Other administrations have adapted to the Internet, “but they haven’t valued it,” he said. Mr. Hughes has not decided whether to return to Facebook, and the decision does hinge in part on the fate of the campaign. But the lessons he has learned in political life seem to reinforce those learned in Silicon Valley. 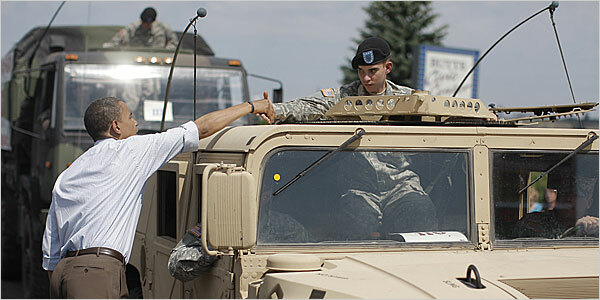 SENATOR Barack Obama, campaigning on July 4 in Montana, greeted a soldier at an Independence Day parade in Butte.